Peru is not on many people’s radar. It’s not on any top 10 retirement destinations lists; it doesn’t get much press at all, really. Mention “Peru,” and most people think of the wonder of the world, Machu Picchu, and…llamas. But during my recent visit, traveling the country, experiencing life there, and speaking with expats who call it home…I think I’ve discovered one of the world’s best-kept secrets. Peru is a large country—it’s about twice the size of Texas. But there are certain places where expats have congregated, thanks to the great climate, beautiful landscapes, and wide range of amenities available…as well as an established expat community that makes the transition easier. Here are my picks for the best places to retire in Peru. Of all the places I visited, the southern city of Arequipa is the one I could most happily call home. The city is built around a UNESCO World Heritage site, a district of well-preserved Spanish-colonial homes and churches. Arequipa is known as Peru’s “White City,” as many of the old buildings are built from sillar, the white volcanic rock quarried in the nearby mountains. And the way it shimmers in the sunlight gives this city a truly special look. 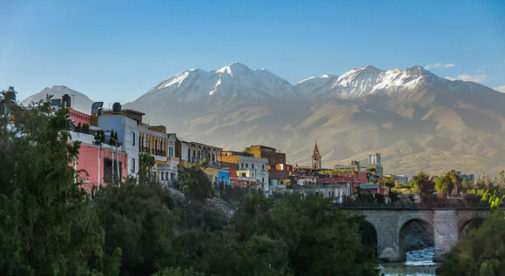 Arequipa is set against a backdrop of three volcanoes, two active and one inactive. Isolated from the rest of the country for centuries, many locals feel that they are arequipeño first, Peruvian second. They have a sublime regional cuisine, too—don’t miss the rocoto relleno, a spicy red pepper stuffed with ground beef, onions, and garlic. But make sure to have a cold drink ready. The rocoto isn’t super-spicy, but it has a slow burn that creeps up on you after the first few bites. The weather reminds me of Southern California. 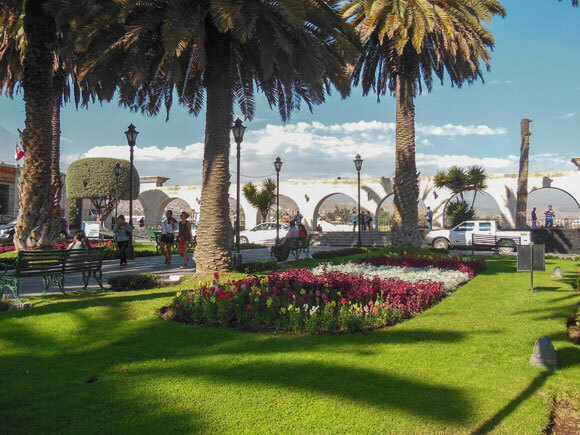 Set in a high-altitude sierra, Arequipa enjoys 300 days of sunshine a year, with only a bit of rain in January and February. And aside from colder months in June and July, temperatures are in the low- to mid-70s F year-round during the day, dipping into the 60s F and high 50s F at night. Perfect for a day at the park or sitting at a café watching the world go by with a coffee…or in my case a hoppy craft beer, brewed right in town, in the company of local beer aficionados. Bill, 65, has been living in Arequipa for about a year. Previously in Granada, Nicaragua, he heard about Arequipa through the expat grapevine. When the opportunity came up to help set up schools for indigenous kids, he jumped at the chance. He lives in the Bustamante district, a modern area within 20 minutes’ walk of the historic quarter. He’s also found it very cheap to live here. “Outside of the tourist area, you have very cheap restaurants. I spend about $30 a week on food, mostly going to the market. It’s cheaper than Nicaragua,” says Bill. Arequipa is a tourist stop, although it receives fewer visitors than Peru’s better-known attractions, such as the Inca ruins at Machu Picchu. You get to enjoy the benefits of a tourist hot-spot, like nice restaurants (I ate at a sushi place and a Spanish tapas bar during my visit), without all the noise and hassle that goes with one. Or the cost. And outside the historic area, you have a bustling, modern metropolis with shopping malls, large supermarkets with imported items—the best of the Old and New Worlds. 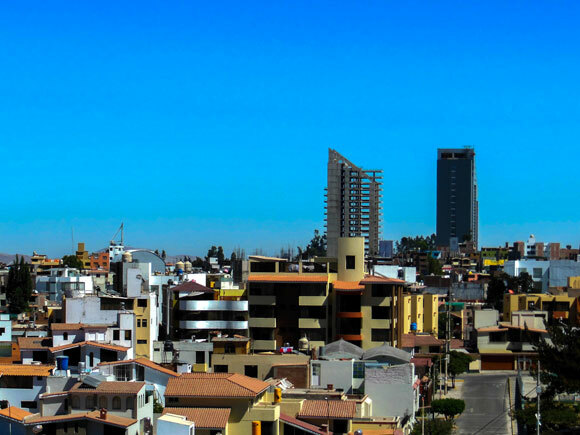 The small expat community here is mostly made up of young people teaching English, spouses of Peruvians, business owners, or volunteers with religious missions or NGOs. But mixed in among them is a growing number of retirees. 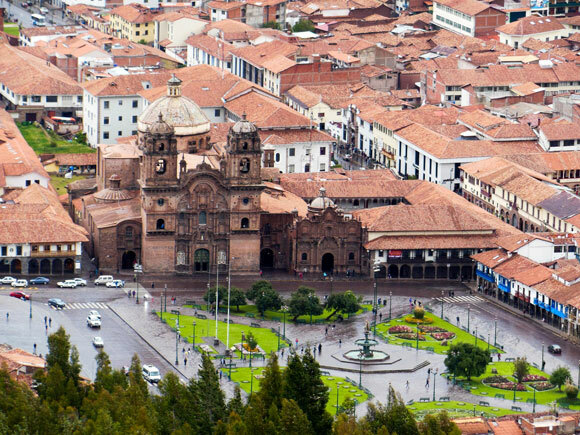 Cusco, the old capital of the Inca Empire and later a major city of the Spanish colony, is a place that breathes history. The colonial quarter, surrounding the showpiece Plaza de Armas, is full of narrow cobblestone streets, cathedrals and churches, quiet courtyards, and vibrant plazas. It’s a booming city of 500,000 people, with red-brick homes and apartment buildings extending to the edges of the valley and up into the surrounding hills. Despite their both being colonial cities, Cusco has a more homelike and historic feel than Arequipa. Perhaps it’s the narrow lanes with uneven pavement, the buildings built on Inca ruins, the indigenous dress on display by everyday residents…this was the center of Inca life, and it still is to this day for their descendants. As I strolled the old city, I often stopped to just admire the architecture and think about who had been walking these streets 400 years ago. It was a good excuse to take a break, anyway: Walking up hills at 11,000 feet in elevation can take your breath away. One thing to keep in mind is that this is a tourist stop, usually combined with a trip to Machu Picchu. The waiters waving restaurant menus and tour brochures are numerous but polite, and they quickly dissipate once you leave the main plaza. Tony Ballantine, 58, has been living in Cusco for three years. Originally from Scotland, he’d been living in the U.S. for many years before moving to Peru to study Peru’s shamanic traditions. Tony is studying traditional healing practices, which are slowly dying out as the influence of Western culture grows. Despite the gleaming shopping malls, modern services, and international restaurants tourism has brought…not to mention the charming historic district…there is still much to get used to. The Sacred Valley, just outside Cusco, is a narrow strip of flat land between the towering peaks of the Andes. Its history goes back centuries as an agricultural center for the Inca and their descendants, who still farm here today. It’s an area of small villages and farming communities, with homes of mud brick. Herds of sheep and alpaca graze pastures next to ancient Inca ruins. Local women still wear colorful traditional clothing, a combination of Inca and Spanish-colonial influences—intricately woven and colorful shawls, layered skirts (called polleras), and distinctive hats; often you can tell which village someone is from by their headgear. You’re as likely to hear indigenous Quechua spoken as Spanish in local markets. Many expats are drawn to the ancient spiritual traditions here, as much as to the slower pace of life and astounding natural beauty. If you want to set up a homestead, cheap land prices mean it could be a reality. Will Janecek, 46, has lived in the valley for 12 years, running an adventure tour company. He’s seen a lot of change. Ten years ago there were no cars, not to mention internet, in the village of Ollantaytambo, where he lives. But what originally brought Will here as a traveler and compelled him to stay remains the same. Urubamba is the regional center and largest town. Here you’ll find ATMs and banks, as well as the colonial plaza and surrounding narrow streets. Ollantaytambo, farther west, is the gateway to world-famous Machu Picchu. A refuge of the king in Incan times, the buildings from that era are still in use today, as restaurants and hotels to serve the tourists who come through town. 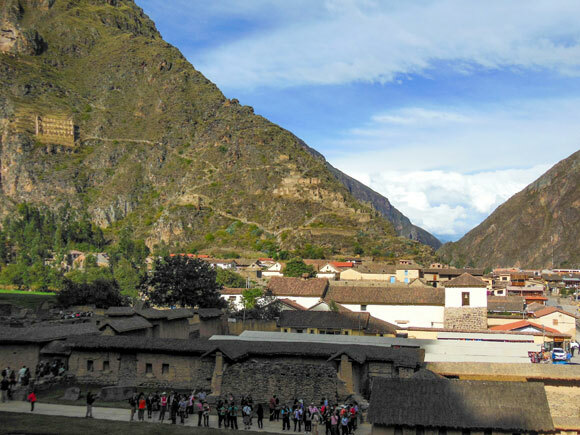 Pisac, on the east side of the Valley, is well known for its huge craft market and is one of the most popular expat spots. As Peru is a big country, there are other areas you should consider, too. The following were on my list, but I didn’t manage to visit them during my recent trip. However, from what I heard from people on the ground, they seem to be worth checking out. And we’ll be checking them out soon. The colonial city of Trujillo is increasingly on expats’ radar. Like Cusco and Arequipa, it has a revitalized historic center. And it’s a great home base for exploring the beaches to the north, like Huanchaco, which is known internationally for its surf. In Trujillo itself, you’ll enjoy a vibrant arts scene and regular cultural events. Huaraz is a small city but an adventure-sports capital, thanks to its location in the Andes. It’s a home base for trekking, rock climbing, alpine climbing, mountain biking, and more. If you’re into these types of activities, this is your place. Iquitos is in the heart of the jungle. It was a turn-of-the-(last)-century rubber boom town and now has a faded elegance that draws adventurous travelers and expats. It can only be reached by river or air and is best for those with a pioneering spirit who are drawn to life on the frontier. You really can live well on the cheap in Peru. Your cost of living will, of course, depend on your lifestyle. But many expats report spending about $1,500 a month, all in. Utilities are affordable. In Arequipa and Cusco, where air conditioning isn’t needed, electricity will run $50 to $60 a month. Water is $10, and high-speed internet/cable TV about $70. “We live the same as we do at home; we go out as often, although we do prefer the local food,” says Marcia Tait, 65, from Alberta, Canada. Marcia and her husband, Tracy Kolenchuk, 63, live in Arequipa four months a year, bringing along students who are involved in community work. They pay $389, including utilities, for their two-bedroom apartment. Their total monthly expenses run $1,300 to $1,500. That’s a fraction of their cost of living in Canada. “I tell friends we save money when we’re here,” says Marcia. I was amazed at how inexpensive restaurants are—even “fancy” places. A plato del día (a hearty soup or stew, or a plate of chicken with side dishes, for example) at a no-frills eatery will run you $2 to $3. My favorite meal was in Arequipa, at a picantería, which showcases typical native dishes. The super-americano combo plate, with a stew, potatoes, roast pork, and two other dishes, was just under $8. One night in Cusco, I splurged on a steak and two glasses of Malbec from Argentina—$25, with a generous tip for outstanding service. You will find that, in a tourist-heavy town like Cusco, there are markups at the restaurants among the tour companies and hotels…and the same with property prices. But go just outside the historic center, where Peruvians and in-the-know expats go, and there are still plenty of affordable options. Of course, for the steak dinner I had in Cusco, I could easily pay double in the U.S.
Getting around is cheap, too. In town, even cross-town taxi rides are $3—and most trips are $1 to $2. If you want to take a taxi around a region or between towns, it’s also affordable. I hired a driver for a tour of the Sacred Valley, with plenty of stops at towns and villages. For about four hours on the road, I paid $50, including a generous tip. The driver was a gregarious fellow, teaching me Quechua phrases and pointing out hillside Inca ruins as we traversed the region. I learned more about Inca history from him than any museum I visited. To get from big city to big city—say, Lima to Cusco—bargain regional flights cost under $100. Rental homes and apartments are very affordable throughout Peru. You can find furnished two- or three-bedroom apartments in convenient, safe neighborhoods for $400, and sometimes a lot less. This is a big reason why retirees can enjoy Peru on a modest budget. In Arequipa, in the desirable Yanahuara neighborhood, is a three-bedroom apartment for $398 a month. It’s just across the river (a $1 taxi ride) from the Plaza de Armas, in the city’s historic center. Prices like this are typical here. If you’re in the market to buy, you can have a three-bedroom apartment with panoramic views of the city for $125,000. Cayma is another desirable area of Arequipa. It’s favored by expats and well-heeled locals who want a modern building and proximity to the historic center. Here you can rent a three-bedroom apartment in a modern building for $516 a month. A three-bedroom apartment across the street from a park in Cayma is $108,000. In more outlying districts like Cerro Colorado or Paurcarpata, which is near the recently opened North American-style shopping mall, you can also find affordable homes, like a three-bedroom apartment near the shopping mall for $86,000. In Cusco, rentals and for-sale properties in the colonial quarter can be pricey. But if you’re willing to walk 10 minutes, in neighborhoods like Lucrepata you can get a furnished one-bedroom apartment for $350 a month, all utilities included. On the outskirts of town (but a cheap taxi ride into the center) is an unfurnished three-bedroom apartment for $209 a month. Buying in Cusco is also affordable. A two-bedroom apartment about five minutes’ taxi ride east of the Plaza de Armas is for sale for $67,700. In the same area is a three-bedroom apartment for $110,000. A two-bedroom town house just south of the historic area is going for $66,000. See Ciudadcusco.olx.com.pe and Ruedadenegocios.com.pe. A great resource for finding affordable rentals for short- or long-term stays in the Sacred Valley, as well as property for sale, is the Facebook group Sacred Valley Housing and Market. Recent listings include a one-bedroom apartment for $242 in the center of Pisac. In the countryside, with views of the mountains and farm fields, is a 2,300-square-foot house for $142,000—it’s between Urubamba and Ollantaytambo. See: Integralprojects.com. You also find good-value real estate in Trujillo. A four-bedroom home in a modern suburb—outside the colonial center—is available for $92,000. A typical rental—an unfurnished, two-bedroom apartment near the center of town—goes for $275 a month. There is no single comprehensive real estate or rental website in Peru. Most real estate agents are independent. So network with expats and Peruvian friends, keep an eye out for signs, scan several rental websites, and check your town or city for a printed classifieds newspaper. Spanish-language classified-ad sites like Olx.com.pe and Adondevivir.com often have more listings and cheaper deals for properties to rent and buy. While Peru’s healthcare doesn’t reach the quality level found in Mexico, Panama, Costa Rica, or Colombia, good healthcare is available in Peru. And it’s low-cost, to boot. The best hospitals and facilities are found in the capital, Lima. Cusco and Arequipa also have a suite of hospitals and clinics. The more rural you go, the more limited even basic healthcare becomes. Most Peruvians and expats prefer private hospitals—public facilities are crowded and don’t offer a great level of care. With private providers, you can pay cash or use insurance, either with a Peruvian company or an international carrier. A night at a local hospital is $40 cash. A consultation with a doctor averages about $30. Expats here report good care from Peruvian doctors and hospital staff. Many doctors here speak English, although staff usually don’t. Although Peru is becoming stricter with some of its visa rules, it is still an easy place to retire to. For years, many expats managed to live here without ofﬁcial residence. As “perpetual tourists,” they simply crossed the border into Bolivia or Chile (or ﬂew back to the U.S.) to renew their 90-day tourist visa. Another option was just to pay the $1-a-day ﬁne for overstaying. But as of August this year, new laws could eliminate this practice of border runs. According to immigration attorneys, you’ll only be able to stay in Peru 180 days out of the year. How this will be enforced remains to be seen. Luckily, under the rentista residence category (the best for retirees), you need just $1,000 in monthly income from Social Security, a pension, or investments. That amount must be transferred to a Peruvian bank account owned by you. Add another $500 a month for your spouse if they’re a dependent. You won’t pay taxes to Peru on your overseas income, and you can import a container of household goods tax-free. You only have to stay in the country one day a year to keep your residence. For your application, you’ll need the usual documents, translated into Spanish: criminal background check, birth certiﬁcate, marriage certiﬁcate, and proof of income. It’s best to hire an attorney to walk you through the process. It takes about 60 days to be approved after you’ve applied, especially if you don’t speak Spanish. Sergio Vargas, who works in Lima and Cusco, is an English-speaking attorney experienced in expat immigration matters. You can reach him at Nvcabogados.com.